TUGboat, Volume 38 (2017), No. 1. 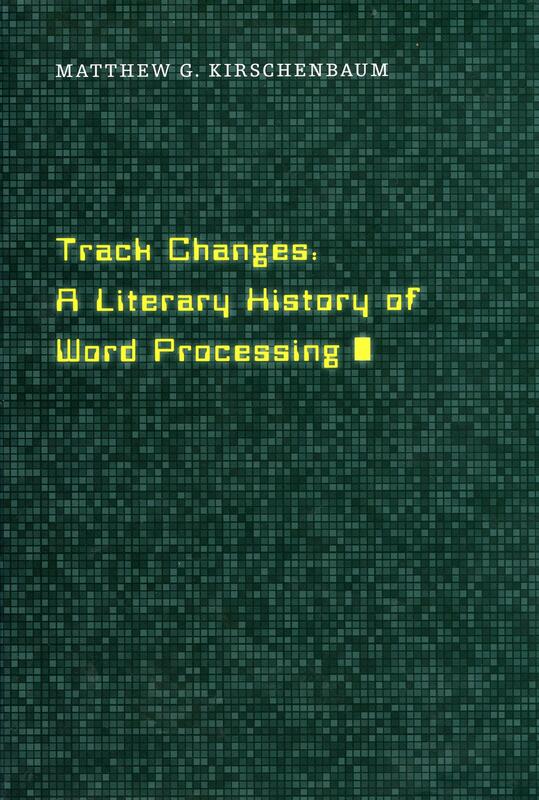 Matthew G. Kirschenbaum, Track Changes: A Literary History of Word Processing. The Belknap Press of Harvard University Press, 2016, xvi+344 pp. Hardcover, US$29.95. ISBN 978-0674417076. In the Acknowledgments section of Matthew Kirschenbaum’s Track Changes, he notes that in December 2011 he gave a lecture on his research at the New York Public Library, and a New York Times reporter wrote about his interest in the history of word processing.1 The resulting “burst of publicity [flooded his inbox] with tips, anecdotes, contacts, and suggestions”. Much of this helped the author develop his book; and, although the book is now published, the author says that “this is still very much an active project, and I’d be grateful to hear from any readers who have additional information”. The author is a professor in the English Department of the University of Maryland who “is a devoted scholar of all things digital and literary”. In this book he studies the steps and impact on their writing of authors moving from pens or typewriters to word processors, from the earliest word processing kludges of equipment before word processing was really available as a product and continuing through writers who cling to “boutique” word processing systems (e.g., Scrivener and WriteRoom) in spite of the “hegemony” of Microsoft Word. While there is a sociological slant to the book, anyone who (a) has lived through the era of the development of interactive editors and word processors or (b) who is a reader of fiction (particularly genre fiction), will find in the book many authors, books, and systems to remember and a plethora of previously unknown information. The book’s style falls somewhere between creative non-fiction and an academic monograph. It is not based on a few characters used to drive a narrative ahead (like most books by, e.g., Tracy Kidder and Michael Lewis); rather, it’s a collection of stories about hundreds of individual authors. Although it has 80 pages of notes and the chapter titles appear to be working on moving along an academic thesis, the book is easy and fun to read. Knuth and TeX are mentioned once in the book, on page 30 where author Neal Stephenson is described as transcribing his Baroque Cycle, originally drafted longhand, into TeX using Emacs; then, when the publisher wanted to typeset the book in the QuarkXPress, Stephenson wrote a conversion program in Lisp.2,3 Perhaps the longest of the hundreds of authors mentioned in the book is the story of author Len Deighton’s adoption of early word processing technology (i.e., IBM’s MT/ST system). The book also has a nice index of systems and author names, which lets one see if one’s favorite author is mentioned in the book or to look up history on an early word processing system such as WordStar. Track Changes is a pretty useful reference book as well as being fun reading. I am glad to have a copy. To get a better feel for Track Changes, you can “Look Inside” on the book’s Amazon page. Also take a look at the author’s website4 to see other essays and videos as he continues his work at the intersection of the literary and the digital worlds. I am finding it all quite fascinating. At minimum, I can recommend borrowing Track Changes from your library. 3I am wondering about other fiction authors who may have used TeX et al. to do their composing. If you know of any, you might communicate what you know to author Kirschenbaum (see the last sentence of the first paragraph).